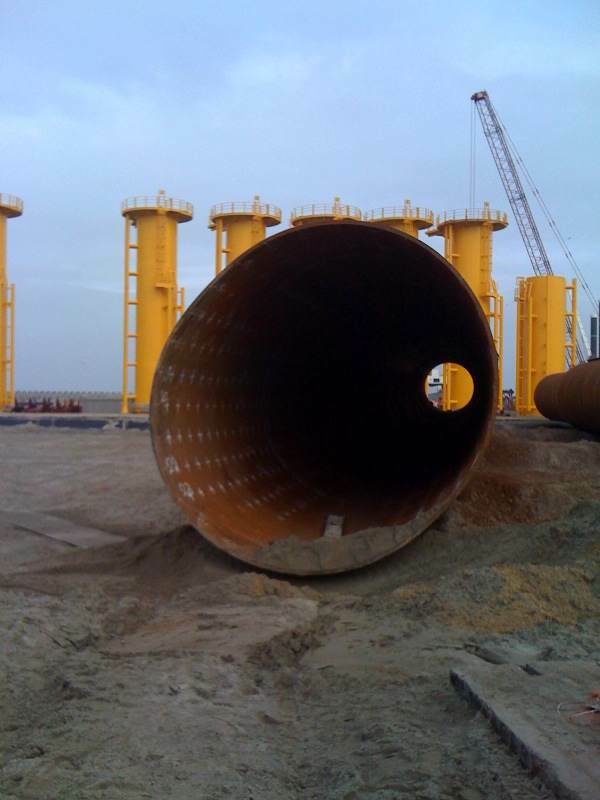 European Tribune - There is (offshore wind powered) light at the end of the tunnel! 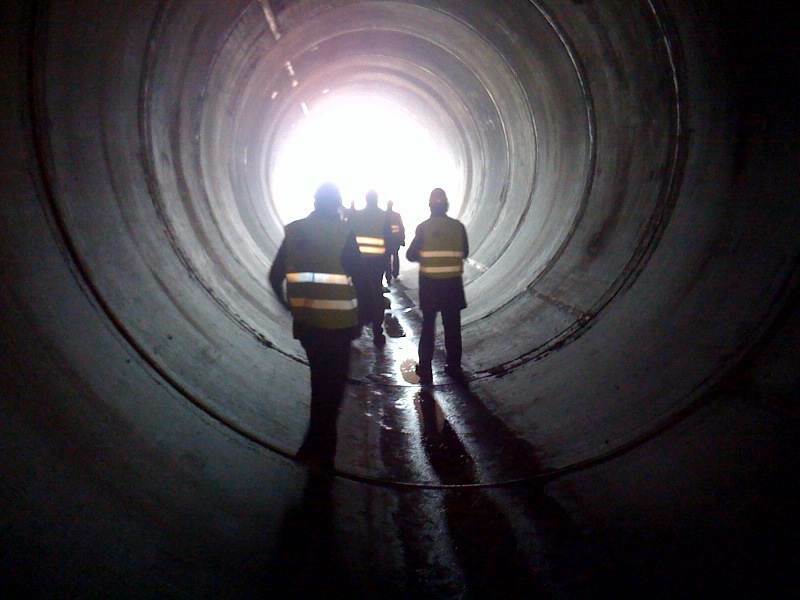 There is (offshore wind powered) light at the end of the tunnel! 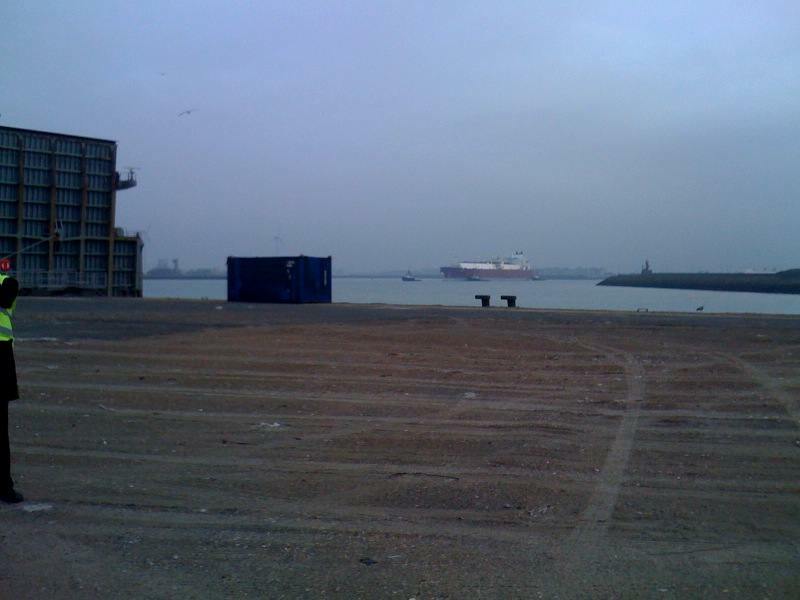 I went on a visit of the port site in Zeebrugge where the foundations for the Belwind offshore wind farm (the financing of which I worked on) have been stored before their installation and wanted to give you a glimpse of the kind of logistics that entails and what kind of problems can happen (and how they are solved). Follow me below for a tour of a small bit of Europe's fastest growing heavy industry. 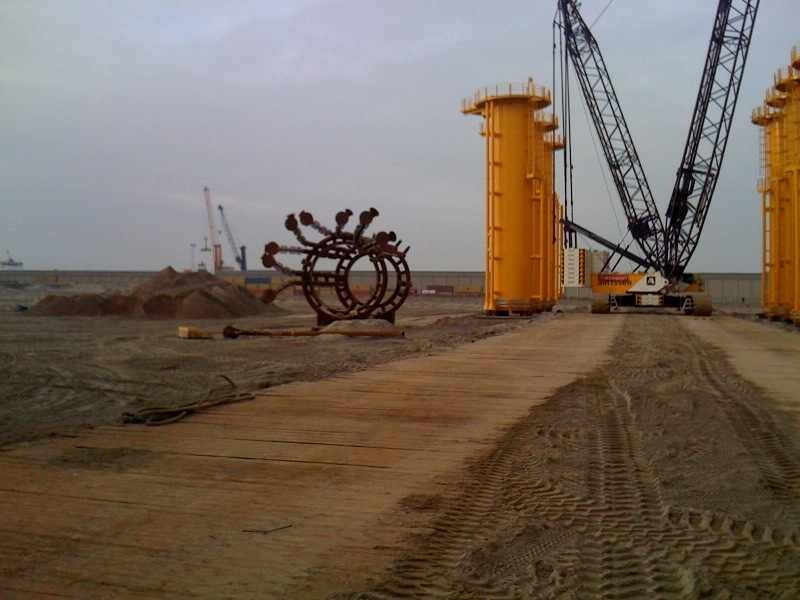 As a quick reminder, there are 3 main types of foundations for offshore turbines: monopiles, gravity-based, and jackets/tripods. 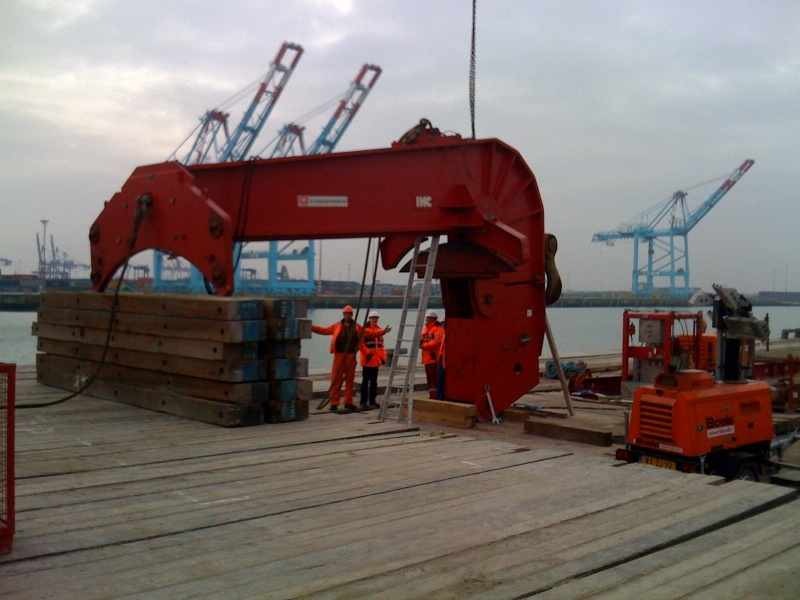 Monopiles have typically been used for smaller turbines and lowers depths, as their size (diameter and thickness) needs to increase with the load to be carried and their cost can become an issue. The price of steel will heavily influence the choice between the technologies when several are possible. In this case, with 3MW turbines in 20m depth, monopiles were the most logical choice. Foundations include two main parts, the foundation itself (the part that's driven into the subsoil) and the transition piece (the part that's affixed on top of the foundation and carries the turbine tower). The transition piece usually includes the boat landing, access platform and j-tubes (the steel tube that protects the electrical cable going to other turbines and/or the transformer station, it is curved near the ground to allow the cable to go from its underground trench to the turbine, thus its name). which has several cables going to several "strings" of turbines. Note the anti-corrosion protection on the j-tubes. 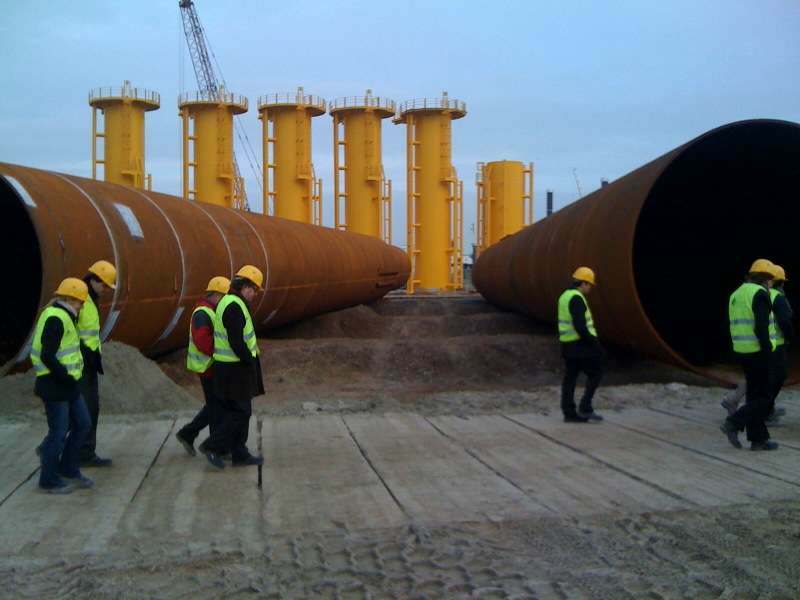 It also plays a vital role in that it corrects any flaws in the verticality of the foundation: turbines require the towers to be within one half degree of perfect verticality in order not to have to bear inappropriate loads, and it is not so easy to hammer 50m long steel columns in the sea ground to such precision; the transition piece is designed to be adjusted to provide the perfect position required for the turbine over the water. Another aspect which requires a lot of precision is the roundness of the foundation and the transition piece. The two of them must fit together (more on this in a second), and the transition piece needs to be in the exact size for the first part of the turbine tower to be bolted on top of it - tolerances are below a centimeter (the bolts are big ones - a couple centimeters thick, but they need to fit in over the whole diameter of the two parts...) for equipment measured in tens of meters. The foundations here have a smaller diameter in their top part, in order for the transition piece to be lowered on top of them and around them. The two parts are then grouted together (a special concrete is injected between the two pieces, this is done on site, naturally, and under water). the narrower top part of the foundation is quite visible on this picture. the j-tubes will be attached to these alongside the foundation part under water. 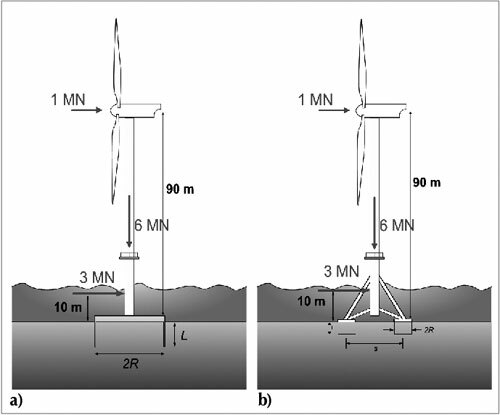 Some offshore windfarms use a different connection between foundation and transition piece, with the trnasition piece snuggling inside the foundation. 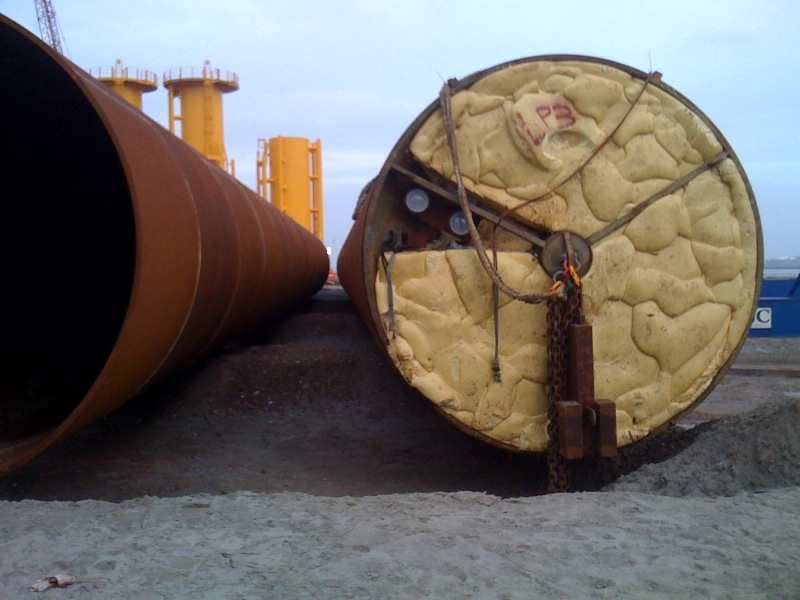 One European windfarm has quality issues on the grouting in that configuration, and there are worries that the turbines could slip lower into the foundations (which is not that important) and lose their horizontality (which is a big problem...). with the design here this is less of an issue as the wider diameter below acts as a stop should the grouting fail. "Ovality" is also an issue for foundations as the transition pieces need to fit on top of them, and it needs to be checked carefully. As you can see, the above foundation has a serious problem: it's really not round. 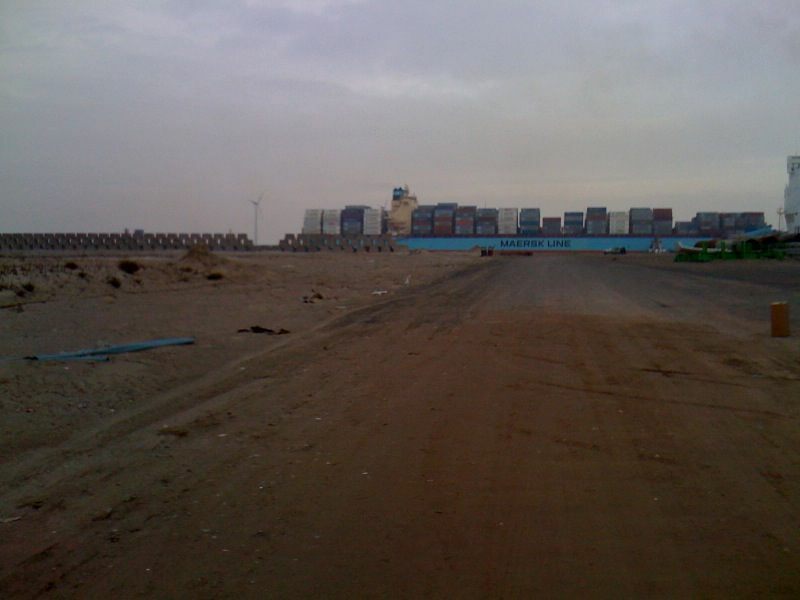 In that case, it is not a manufacturing problem: that foundation sank during the transport to site and hit the seabed... The project company, together with the insurance companies, is investigating the best way to deal with this problem: replace it completely, try to improve its roundness by squeezing it back into shape (the giant steel "pinch" for that was being prepared on site when we visited) or, quite possibly, use it as it is (by luck, it is the bottom part which was damaged, ie the part that goes in the sand, so ovality is less of an issue there as long as the vertical penetration in the soil can still be controlled). The reason the foundation sank is that it was transported to site by floating it - plugs were installed on each end and the foundation could simply be pulled on the water. installed on the next one about to go to site. and the foam makes it float back to the surface to be recovered. and bring them from their horizontal transport position to the vertical on site. It was temporarily on site for some repairs/maintenance. 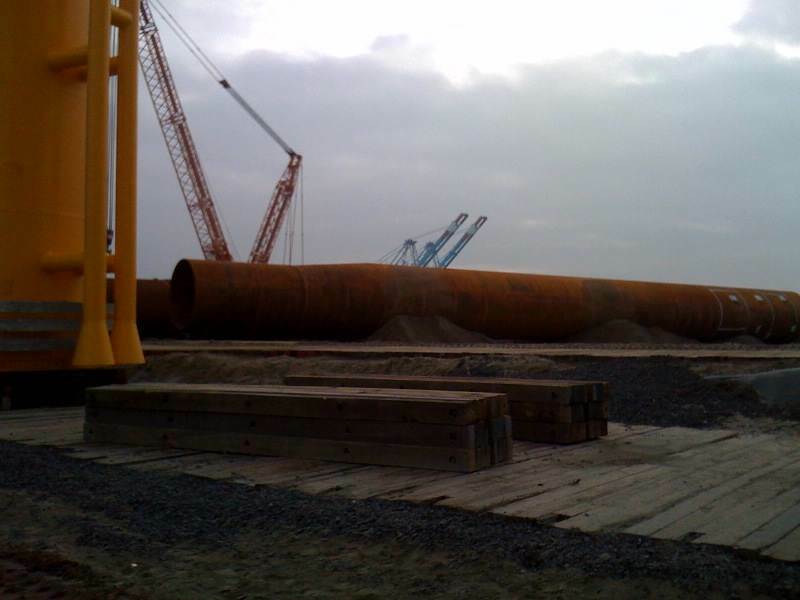 The project is expected to finish installing the foundations and transition pieces in the short future, and move on to the installation of the turbines. These are going to be soon delivered to a harbour site nearby (so, no pictures this time), with completion in the course of this year. The turbines will be erected on their towers on the site inland, and transported as a whole to the site - the erection is expected to attract quite a bit of attention in the area as it will be highly visible. 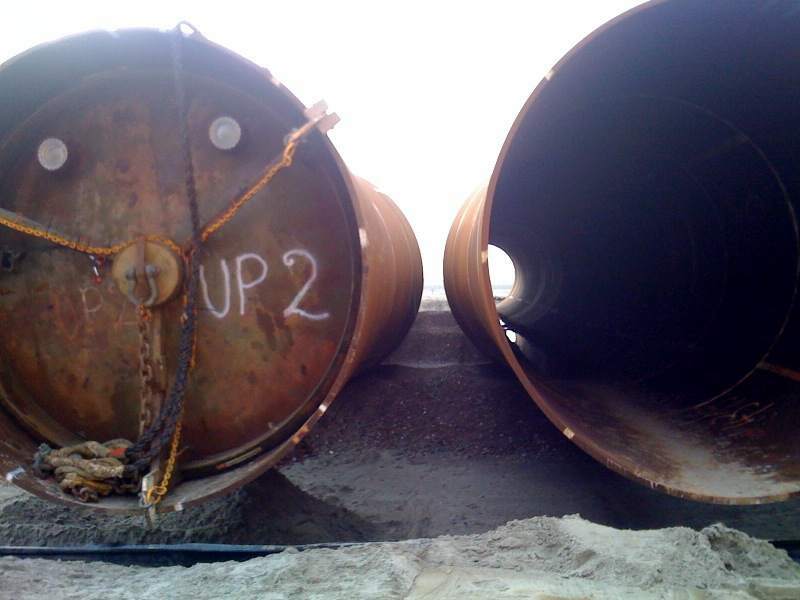 how is corrosion controlled with all that steel in seawater? same as ship hulls - with chunks of lesser metals covering the surface of the steel (Im hopeless, I never know if it's anodic or cathodic protection, maybe the chemists on board can help). It uses the destructive effect of electrochemical corrosion to protect the steel. mentions a way to use cheap material if an electrical current is forced between the steel and the sacrified material. Zinc is more expensive than steel and electricity should not be a problem, so this variant may be used in offshore windpower. But I don't know for shure. 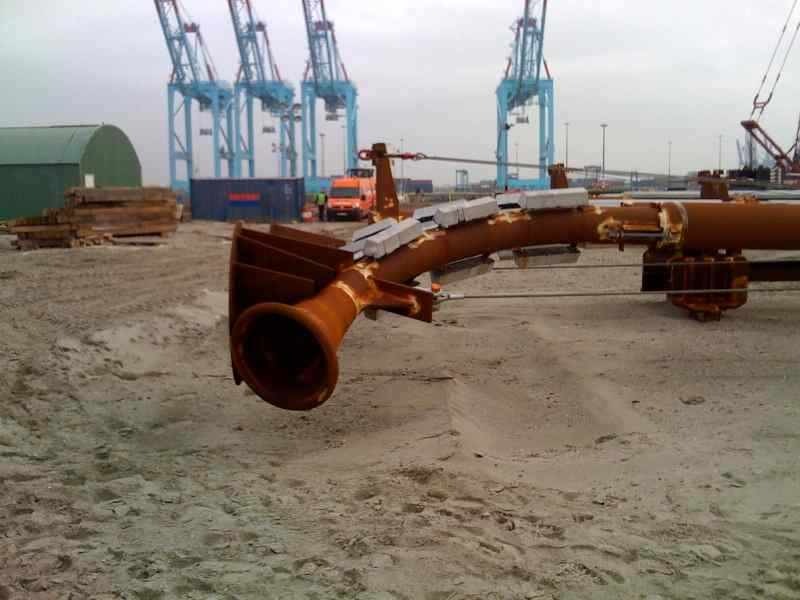 The picture with the tripod looks like the turbine at Hooksiel (a single near-shore installation for testing and exercising). In 2008 I was on vacation there and saw some preparations for the erection going on. Right on both counts: it's cathodic protection through the use of a sacrificial anode. One of the most common installations for my photovoltaic systems, back when I was a PV designer in the 1990s, was cathodic protection of oil pipelines. (others included powering hazard warning lights on oil rigs, and microwave telecom relays for PDO Oman). Renewables helping out the fossil fuel industry. Strange world, huh? I don't think it is strange. I believe the fossil fuel industry is not so much ideological about renewables. It is simply about maximizing profit. They really like it when (and are pushing for) their propaganda departments and politicians take an ideological approach to prolong the use of their existing infrastructure and monopolies in this field. Especially as the stuff gets more and more expensive over time they try to squeeze as much as possible out of it. But in fact they are already heavily investing (and profiting) from renewables. They simply don't talk so much about it but of course they want to control the inevitable transition. From my experience they use every technology available and have no reservation with green technology. I'm developing customer specific electronics and software for Li-battery management systems which are used in all kind of stuff that moves around: cars, buses, bikes, planes, inspection robots and AUVs. Although this is not exclusively "green" technology, it is somewhat related because of the hype of electric and hybrid cars and other projects (like Solar Impulse etc.). But of course the raw material industry uses the advantages of Li-Batteries for offshore prospection, pipeline inspection and the like. I think they will use wind and solar energy to get the last drops of oil (and other resources) in a few decades, not for burning it up in cars or power plants but maybe for expensive drugs or otherwise difficult to produce plastics or other needed products. I would use the old offshore oil and gas platforms to set up high voltage dc converters and the pipelines as protection pipes (or as the ground wire too) for the cables to the shore. Surrounding the platforms big offshore wind farms could be built then. I'm pretty shure there are studies about that in the drawers of the fossil industry already. They really like it when (and are pushing for) their propaganda departments and politicians take an ideological approach to prolong the use of their existing infrastructure and monopolies in this field. That's the key: they hate losing market share. However, the presently most widespread renewables -- on-shore wind, rooftop solar --, especially when paired with a feed-in law, are structurally predisposed to bring in many new small owners and thus break monopolies. The energy giants will (do) like off-shore wind much more (not to mention centralised solar power, hence the support for the IMO pie-in-the-sky Desertec). But, even when existing energy giants build renewables, they will be less enthusiastic about an accelerated replacement of their existing plants, though. Basically a combination of two of the above. After Jérôme explained it for a monopile, the question arises: how do they regulate vertical alignment on a tripile? Currently same method although more measurement and correction intensive. Jérôme didn't state explicitely, but I took it that the transition piece can be rotated. However, to adjust a level surface on a tripole, I imagine height difference is needed.